How do I use the Purchase Order System? 3dcart's PO system allows you to automatically generate and send Purchase Orders to your distributors when your stock on distributor provided product runs below specified limits. Purchase orders are grouped by their respective distributor, and can then be submitted directly from your 3dcart Online Store Manager as needed to re-order and replenish your stock. Furthermore, as the product is received, you can then restock them to your store all from the same location. This article will show you the basic steps of using this functionality. Next, use the search bar at the top of the page to search for "PO System" to bring up the PO System module. Place a checkmark in the Enable checkbox and save your changes with the "Save" button at the top right. You can also click on the "EDIT PO NUMBER" link to set your store's PO prefix and numbering that will be used for the Purchase Order Invoices you will be generating. This functionality works similar to the regular store's Invoice prefix and numbering system. As POs are generated, the store will name the Purchase Order invoices with the appropriate information. Click on the Action Wheel to the far right of the distributor listing you'd like to view and select "Edit"
Scroll down to the bottom of the Distributor listing page to view your new PO Settings. This checkbox will automatically notify the distributor when the PO is created. Uncheck this box if you'd like to manually notify the distributor. Edit the Billing information that the Purchase Order will be invoiced to. Add/Edit any additional information n eeded for the distributor. After enabling the PO System in Store Modules, your individual product listings will now contain a special Reorder QTY field in each product's Information Tab. This field will be similar to the Stock Alert system which is designed to email you (Merchant) as product stock levels fall below a certain point. However, instead of emailing you about the lowering stock level, the Reorder QTY option will designate when the item is placed in the PO System Queue. For example, you may have an item that you'd like to automatically have a PO generated for when it falls below 5 in stock. In the Reorder QTY field, you would place a 5 in the field and when the product reaches 4 in stock, the PO system will list the product and prepare it for reorder. Locate the product you'd like to edit and click on its thumbnail, name or ID to open the product edit pages. While viewing the product's Information Tab, scroll down to the "Inventory Options" section. You must have Inventory Control turned on for your store in order to see this section. If you do not have it turned on, you may do so by going to Settings ->General ->Store Settings and clicking on the "General" tab along the top to "Enable Inventory Control." Look for the product's Reorder QTY field and enter your desired reorder Qty. When stock falls below this level, the product will be placed in the PO Queue. Save the product's listing page. You can also create a custom export set for this purpose by adding the custom field "reorder_qty" as a custom CSV export. Click here for more information on creating custom export sets. As described, when the product's stock falls below the specified level, the product will be added to the PO Reorder list which can then be used to generate Purchase Orders for the product. In the Purchase orders page, click on the "PO Reorder" button. You will see the product(s) ready for PO listed in a graph. The graph will contain the Product's ID, Name, Cost, and distributor information along with other fields listing the Last PO date (of the previous purchase order for the item), the last PO qty that was ordered, the current reorder quantity, and the current stock of the item(s). The default Reorder Qty will reflect the Qty entered in the product's individual Reorder Qty field, but this can be changed to suit your needs for the reorder process. To continue, we will now process the PO and move it into the PO Queue. Click on the "Submit to PO Queue" button. For larger stores with many products and distributors, the PO Reorder page can be filtered to help narrow down your selection of available reorder products. Filtering can be done based on Product Search Keywords, Distributors, Manufacturers and Categories as needed. After submitting the product to the PO Queue, the page will refresh and your selected products will be removed from the list (as they are placed into the PO Queue at this time). While viewing the PO Reorder page, click on the "PO Queue" button to view the PO queue. A confirmation window will appear. Confirm the selection or cancel if you need to wait. After confirmation, a secondary popup will ask you if you'd like to notify the distributor of the Purchase Order. Notifying the distributor will create the PO invoice and email it directly to your distributor if this option is selected. Don't worry if you don't notify the distributor yet. You will also get a chance to do so when viewing the actual Purchase Order. In some cases, merchants prefer to fax or send the invoice directly to their distributors instead of relying on email. Therefore, the choice can be made to notify on submission or manaully print out the invoice and then email the distributor if desired. After confirmation of the Purchase Order, you will be taken BACK to the PO List page where your new Purchase Order is waiting to be reviewed or edited as needed. The PO will contain the PO Invoice Number, its creation date, the distributor it will be submitted to and the number of items within the PO. If the Purchase order was generated (in previous steps) for products provided by separate distributors, then there will be one PO created for each applicable distributor. Click on the Purchase Order's "Edit" button to view its details. From here, you will see all of the Purchase Order information including the Shipping and Billing information and the items contained in the Purchase Order. The PO can be edited to fit your needs such as controllong its due date, or changing the email address it will be delivered to. Save any changes made to the PO. After submitting the PO to your distributor(s), the next step is to await replenishment of your order. After you've had your inventory replensihed by the distributors, the next step is to receive your Purchase Orders. Follow these steps to receive your Purchase Orders. In the PO status filter, select "Sent" and click "Search POs"
Select your pending PO from the list and click its "Edit" button. You will be shown the Purchase Order page along with the same buttons at the top as before. However now, you will also have a "Receive PO" button available. Enter the quanity of item(s) received and click "Save PO"
After saving the Purchase Order, you will see your received items listed. YOu will also see a new button allowing you to restock inventory. Clicking on this button will add the received items back to your store's Inventory. During restocking, you will be asked to check whether your FULL order has been fulfilled. This is present in case you receive partial refill of orders and would prefer to wait until the full order is shipped to you before restocking the available inventory. 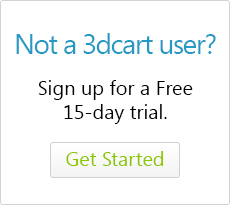 If you are currently using 3dcart's Add-On for multiple distributors, you have the ability to specify more than one distributor for your products. When using the PO system on items that are provided by multiple distributors, the PO system will favor the distributor that provides the item at the lowest cost. If all of the product's distributors provide the item at the same cost, then the PO system will favor the catalog ID of the distributor to determine who the PO is generated for.